What a difference a week makes. 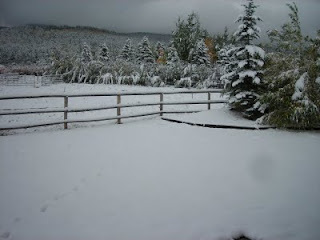 We seem to have vaulted directly from summer to winter here in Driggs, Idaho. Tuesday was 75-degrees & sunny, and by Thursday it looked like this. 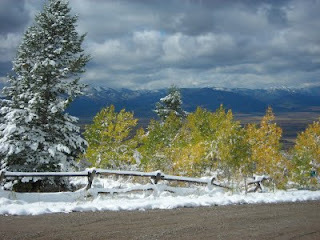 Friday & Saturday were clear, but then more snow arrived last night and this morning. Temperatures are now only in the 30's...what happened to fall? 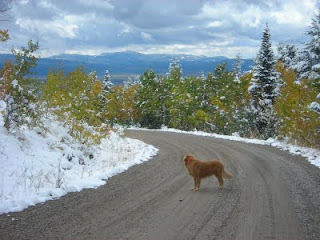 Bridger enjoyed the season's first "snow hike," which was especially colorful with the fall leaves just starting to turn. I do hope fall colors get a chance to shine at some point this month. After the late start to summer this year, a couple weeks of classic Indian Summer weather would be enjoyed by all...except maybe the elk hunters. 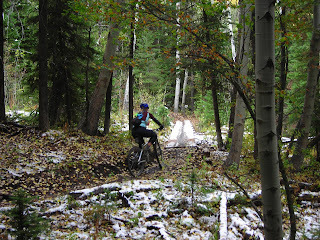 Joanne & I took advantage of the brief weather break on Saturday for a nice mountain bike ride, out on the Horseshoe singletrack trails. They were somehow dry, except for this shaded area with a bridge crossing, which made things interesting.